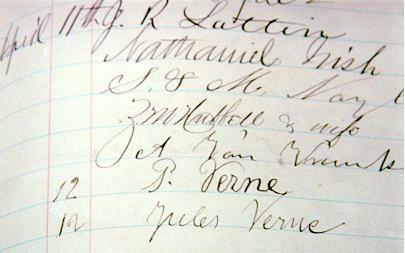 The following images show the signatures of Jules Verne and his brother Paul. They visited Niagara Falls, and the Niagara Falls Museum when they came to North America in 1867 aboard the Great Eastern. This was Jules Verne's only trip to North America. Still larger portion of page, showing address for Paul Verne as Nantes (France) and for Jules Verne as Paris. Below is an image of the sign that accompanies the Guest Book containing the Jules Verne signature. This was possibly given to the Niagara Falls Museum by Steve Michaluk, Jr. who did research on the whereabouts of this guest book. The image of Jules Verne is one created by the "American Jules Verne Society" in the 1940's, and the text is an excerpt from A Floating City. 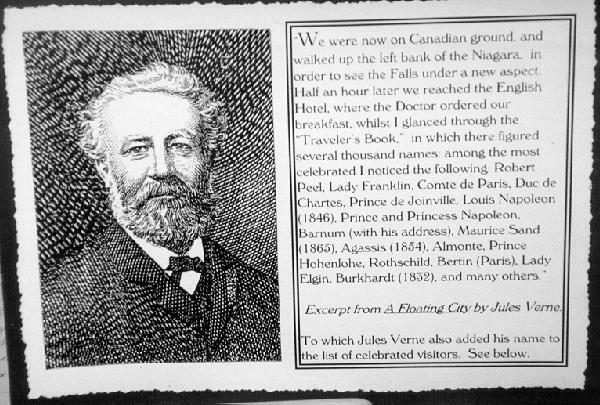 Jules Verne only traveled to North America one time. His visit took place in April 1867, the year of Canada’s confederacy. He traveled to the United States and Canada with his brother Paul aboard the steamship Great Eastern. During the voyage, Jules Verne took extensive notes, and they became the basis for the mostly factual 8th book in the Voyages Extraordinaires, Une Ville Flottante (1871) or in English A Floating City (1874). Jules and Paul travelled together from France arriving in Liverpool on March 18, 1867, expecting to sail on the Great Eastern on March 23. But the voyage was to be delayed, because workers were feverishly working to get the ship ready because this was its first voyage, after being converted back from a cable laying ship by a French syndicate, “Société des Affréteurs du Great Eastern”. On March 26, they finally embarked on the Great Eastern in Liverpool for what should have been a 10 day crossing to New York. The ship had been fitted out to carry 3000 passengers but there were only 123 on this voyage. The voyage finally got underway but instead of taking 10 days, because of storms and bad weather the voyage lasted 14 days, and they finally docked in New York City on April 9th, 1867. This longer crossing meant that Jules’ and Paul’s North American visit would be even shorter than originally planned because they had already booked passage on the Great Eastern’s return trip on April 16th. As Jules Verne put it, “one hundred and ninety two hours in America”. Jules and Paul stayed the night at the Fifth Avenue Hotel. This is the same hotel in which Charles Goodyear, famous for his inventions of numerous rubber products, and the “vulcanization process” had died in 1860. In The Floating City, Jules mentions that “the hotel lift hoisted us up to our rooms”. This may have been the same elevator that had been installed in 1859, and used a vertical screw to raise and lower the car. In New York, they walked along Broadway, and saw a play New York Streets, at the Barnum Theatre. Their visit to New York City was very brief and Paul and Jules departed for Albany on April 10 around 6pm, travelling up the Hudson River by the steamer St. John. The St John, was an immense paddle wheeler which could carry 4000 passengers. This part of their trip was slowed by fog, and their arrival in Albany in the morning of the 11th was after the day train to Niagara Falls had left. So this gave them some time to check out Albany. At 1:30pm they departed for Niagara Falls by train, via Rochester, arriving at Niagara Falls, New York, at 2am on April 12th, where they had rooms at the Cataract House. On the morning of April 12th, Jules and a Doctor friend, and I presume Paul, set out from the village of Niagara Falls for the site of Niagara Falls itself. They visited Goat Island, an island of approx. 70 acres (at the time of Verne’s visit) situated in the Niagara River above the Falls. The island separates the American Falls from the Canadian Falls, which are also know as the “Horseshoe Falls”. They also visited nearby Terrapin Tower for a closer look at the Falls. The tower was constructed on a rock outcropping in the river near Goat Island and was connected to it by a narrow footbridge, It was built in 1833 by Augustus and Peter Porter and was right at the brink of the Horseshoe Falls. During the rest of the day they wander along the banks of the river and then returned to the village of Niagara Falls for dinner. After a quick dinner they once again returned to Goat Island and Terrapin Tower for a view of the Falls at sunset. On the morning of the 13th of April, they walked to Canada to view the Falls from the Canadian side. They crossed the river via the iron suspension bridge. This iron suspension bridge had 2 levels. The upper level was for railway trains, and the 2nd level was for pedestrians and carriages. When the NAJVS visited the Niagara Falls museum to see Verne’s signature, the books of signatures (there were probably 50 or so) were referred to as the “Table Rock Albums” (though a description of the “Table Rock Album” in the Museum guide says “It is a selection of prose and poetry written by visitors and compiled by Thomas Barnett in the mid 1800s”.) But, Table Rock was a favourite vantage point on the Canadian side for viewing the Falls. It was a rock outcropping over the gorge that eventually weakened and fell to the river bank below. The book with the Jules Verne and Paul Verne signatures was in a glass case just inside the entrance and is open to the page showing the signatures. But here is where we find a discrepancy with the story Verne has told so far! Surely it is when he saw these books of signatures, that he signed them. According to A Floating City, the day he saw the signatures was April 13th, BUT the date opposite the Verne signatures in the book on display is April 12th! Jules Verne may have manipulated some of the events and dates to make the story better, but biographies generally agree with what is written in the book. I can offer no explanation for this date discrepancy! As the story continues, after they had breakfast at the hotel, they went on a tour behind the Falls. This is a tour that visitors can still go on to this day, donning rain gear, and following a path that goes to an opening behind the falling water. A fictional incident takes place in the book at this point, and after the incident, they go to Clifton house, before deciding to head back to the United States. Instead of crossing by the bridge, they board a boat America, that safely carries them across the river, below the Falls. Today, the boats are all called Maid of the Mist (III, IV etc. ), and tourists can travel close to the Falls by these boats to view the spectacle, but they return to the same side. It is not a way to make the crossing. On the American side of the river, a mechanical railway hoists the travelling party up to the top, and they then catch an express train to Buffalo at 1:30pm. After visiting the shores of Lake Erie, they catch a night train at 6pm and travel overnight to Albany, change trains and a few hours later, arrive in New York City sometime on April 14th. They toured the city on the 15th, seeing the East River, and Brooklyn. At 11am on the 16th they went to pier 37 to catch a tender out to the Great Eastern to begin the return voyage. Verne indicates that the return voyage took 12 days to Brest, and 1 day after that they were in Paris. Jules Verne failed to mention that there were only 191 passengers aboard the Great Eastern for this return trip. The New York Times calculated that this voyage, from Brest and back to Brest, would lose about $100,000. Because of these expenses the charterers of the ship got nervous, and after sending the passengers ashore at Brest, and not allowing any new passengers on board, the ship sailed for London. The French company collapsed, and the ship was seized by the Receiver of Wrecks. This trip was the last time that New York City would see the Great Eastern. So, Verne spent 26 days aboard the Great Eastern, and 8 days in North America, mostly in New York City and Niagara Falls. But this was a fruitful voyage, giving us the book A Floating City, and giving Jules many ideas for 20,000 Leagues Under the Sea. IMPORTANT: Images except for Verne signature were taken from the webpage of Jeffrey James Wolfanger Sick. If you have any questions about collecting, or any of the items that I have shown, please feel free to message me. Back to the Autograph/Signature page.